Since 1876, Jehovah's Witnesses have believed that they are living in the last days of the present world. Charles T. Russell, their founder, advised his followers that members of Christ's church would be raptured in 1878, and by 1914 Christ would destroy the nations and establish his kingdom on earth. The first prophecy was not fulfilled, but the outbreak of the First World War lent some credibility to the second. Ever since that time, Jehovah's Witnesses have been predicting that the world would end "shortly." Their numbers have grown to many millions in over two hundred countries. They distribute a billion pieces of literature annually, and continue to anticipate the end of the world. 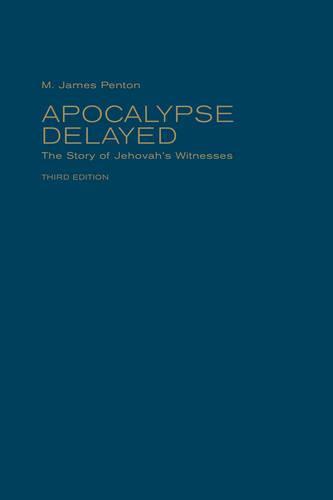 For almost thirty years, M. James Penton's Apocalypse Delayed has been the definitive scholarly study of this religious movement. As a former member of the sect, Penton offers a comprehensive overview of the Jehovah's Witnesses. His book is divided into three parts, each presenting the Witnesses' story in a different context: historical, doctrinal, and sociological. Some of the issues he discusses are known to the general public, such as the sect's opposition to military service and blood transfusions. Others involve internal controversies, including political control of the organization and the handling of dissent within the ranks. Thoroughly revised, the third edition of Penton's classic text includes substantial new information on the sources of Russell's theology and on the church's early leaders, as well as coverage of important developments within the sect since the second edition was published fifteen years ago.